President Trump regularly annoys the establishment media and Democrats by hailing job figures individual companies have promised to create. Last week, he hailed another statistic showing hiring, this one containing data from private payroll company ADP. 'Great news. We are only just beginning. Together, we are going to #MAGA!' Trump tweeted, referencing his campaign slogan. But this is more than just campaign sloganeering. 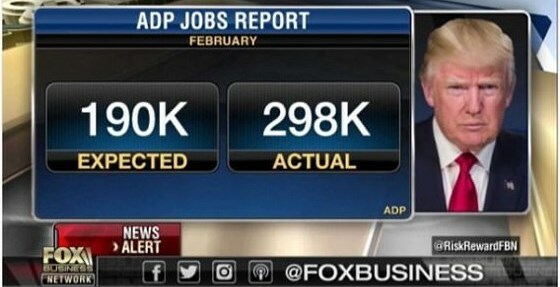 Fox Business Network has recently released an analysis showing industry-by-industry gains in employment for President Trump’s first full month in office – including 28,000 manufacturing jobs. And as the Business Insider’s Akin Oyedele reported, the US economy added 235,000 nonfarm payrolls in February, many more than expected, and the unemployment rate dipped to 4.7%, a report from the Bureau of Labor Statistics showed on Friday. It was the biggest beat relative to expectations since December 2011, according to Bespoke Investment Group. The service-producing sector added the bulk of the jobs as is typical, at 193,000, noted Oyedele. However, the goods-producing sector, which includes manufacturing, gained a record 106,000 jobs. Employers in every sub-sector increased hiring on net, ADP's report showed. After an unexpected drop in January, wage growth was revised higher in Friday's report. Average hourly earnings rose by 2.8% year-on-year in January and February. The labor-force participation rate increased slightly to 63 percent, meaning some people who had been out of the labor force returned, a very important indicator that Trump’s effort to get America back to work is succeeding ever so slightly. That’s all to the good, however there’s some not so good news on the horizon. While over 90 million Americans remain out of the workforce, the unemployment rate is at a level Fed officials consider to be full employment, which means virtually everyone who wants a job can get one, at least according to elitist economic theory. This jobs report and other employment data shown in separate surveys during February are likely to give the Fed its final green light. Raising interest rates means increasing the cost of borrowing for businesses that want to expand meaning the Fed may very well be stepping on President Trump’s efforts to put America back to work. It would be the Fed's second rate hike since President trump’s election and a sign that the central bank's leaders are moving interest rates up at a faster pace this year – contrary to what they did while Obama was president where interest rates were kept at near-zero. However, there is some good news at the Federal Reserve; by April, three key governor positions at the Fed will be open, and Yellen's term ends in January 2018, and the Fed's No. 2, Stanley Fischer's, ends in June 2018. All of these positions will be appointed by President Trump, who was heavily critical of Yellen during the campaign. With this level of personnel turnover in the coming months President Trump will be able to quickly reshape the Fed's leadership toward more economic growth oriented policies.